Cindy Cubelo is a Dog Trainer certified by Animal Behavior College in 2012. Her interest in dogs became a passion when she started volunteering at a local animal shelter and began walking dogs on a daily basis. Wanting to be able to understand them better in order to reduce their anxiety in the shelter environment she began her education. In addition to completing ABC's Dog Training Obedience Course she also completed Training Shelter Dogs, a continuing education course also offered by ABC. Cindy is also a Licensed Presenter for Doggone Safe's Program, Be a Tree, which teaches school age children how to be safe around dogs. She is also a member of Pet Professional Guild, "membership organization representing pet industry professionals who are committed to results based, science based, force - free training," as well as a Volunteer with the Friends of the Southern Ocean County Animal Shelter. Cindy always wanted to experience working in a Veterinary Office so when the opportunity arose in August of 2015 she joined the Ocean Acres Veterinary Office team where she assists Dr. Dreskin in all aspects of the animal's care as well as greeting clients on the phone. She is especially excited about being able to share her knowledge of dog behavior when clients come to the office expressing behavioral concerns with their dogs. Cindy has two dogs of her own; a Bichon Frise named Doodle and a Lhasa Apso named Charlotte, as well as a husband and a son. Although born and bred in Brooklyn, and then Queens, New York, she happily lives now in Stafford Township since 2005, and is thrilled to be part of Ocean Acres Veterinary Office. Whether your pet is having a “ruff” day and needs a little reassurance or comes in with tails held high, Joyce is there to help them feel at home with patience and compassion. 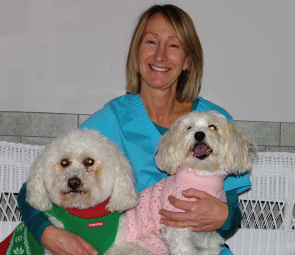 As a veterinary assistant at Ocean Acres Veterinary Office since May of 2016, she takes pride in assisting Dr. Dreskin during your pets examinations, x-rays and surgery. Joyce is also helpful and friendly on the phone when you need to make an appointment or refill any medications. 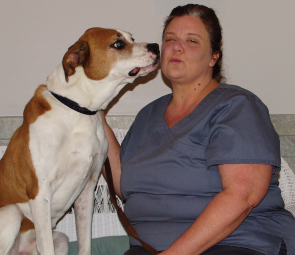 Joyce earned her dog training certification through the Animal Behavior College and enjoys sharing her knowledge with pet parents who may be struggling with anything from housebreaking their new puppy to dealing with common behavioral issues at home. She believes that positive reinforcement, consistency and boundaries are key ingredients to training and bonding with your dog. This approach helps to ensure good communication and trust between you and should start the moment your new dog comes home, no matter their life stage. Joyce’s passion for animals has also lead her to Homeless Paws NJ rescue organization where she has taken an active role in all aspects of the rescue. Joyce has assisted in organizing and attended numerous adoption events for Homeless Paws, helped in transport and has fostered dogs in her home for the last 7 years. She believes in 2nd chances for these deserving animals and will continue to work hard to find their “furever” homes. Being able to combine all these aspects of animal care and compassion into a job where you also feel part of a close knit team where we all have the same goal, has made working at Ocean Acres Veterinary Office feel like home.